Complacent vs. complaisant: What’s the difference? Like we talked about in our recent post on diffuse vs. defuse, the English language is a tricky beast. There are so many pairs of words that look or sound similar. But it isn’t always clear whether they mean the same thing or different things. 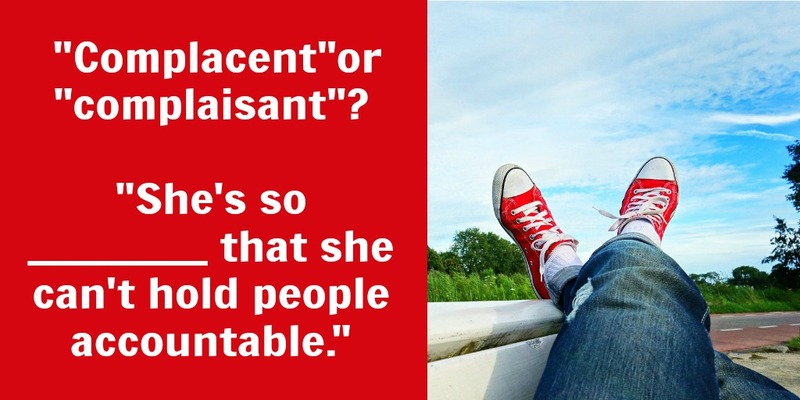 Are complacent vs. complaisant (a) different ways to spell the same word, (b) two different words, or (c) English vs. French translations of the same word? We’re going to solve the puzzle in this post. When you’re thinking about the difference between complacent vs. complaisant, remember that complacent describes being too laid back about something. Does complaisant look like a French word to you? There’s a reason why. Although both complacent and complaisant were ultimately derived from Latin, complaisant more recently came to us from French. When you’re thinking about the difference between complacent vs. complaisant, remember that complaisant describes being eager to please. Are complacent vs. complaisant ever used interchangeably? Different from what they say about diffuse vs. defuse, grammar experts agree that complacent vs. complaisant are separate words. You may sometimes see people use these words interchangeably but only when they confuse the two. This may change as English evolves. But for now, treat complacent vs. complaisant like distinct words. Complacent vs. complaisant are so similar. So how can you remember the difference between them? Here’s a trick: remember that someone who is complacent wrongly thinks that he or she is guaranteed to “ace” something. This something can be performing well on the job, successfully meeting quarterly targets, or simply maintaining the status quo. Complacent vs. complaisant are both words you use to describe people. But you use them in different situations. Use complacent to describe someone who is too laid back about something. And use complaisant to describe someone who is eager to please people. Should you use anxious or eager in this sentence: “I’m _____ to tell Cindy about our awesome Q4 results”? Find the answer in this post on the difference between anxious vs. eager.